The Urban Smart Farm uses old freight containers to grow layers of herbs, vegetables, fish and crustacea sustainably, within the city. In 2016 Smart Farmers built the first version of this unique aquaponics farm as a commercial pilot farm. In 2018 we set up the sequel: the Urban Smart Farm 2.0. All technology is further developed in this large scale Ghent aquaponics cooperation. We stand for profitability, zero-waste food production and participation of all Ghent citizens. 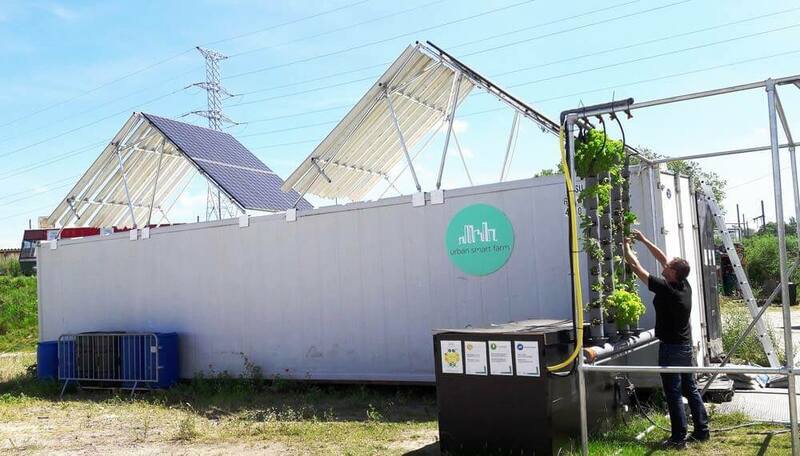 The Urban Smart Farm combines mother wit and Hi-tech under one roof. We use aquaponics, artificial light and natural feed in one closed system to produce fresh vegetables, fish and crustacea. More people dwell in the city than in the country and urbanisation is still on the rise. In Ghent we expect a population growth of 10% within the coming years. Fish populations are threatened and the demand (for protein) is growing. Sustainable fish cultivation in controlled environments reduces the pressure on natural fish populations. Our food often travels far before reaching our plate. We are estranged from our food, but the demand for authenticity and sustainability is on the rise. Traditional farming is becoming more sustainable, but still uses a lot of water. Aquaponics, farming fish and vegetables in one ecosystem, reduces water use significantly. In 2015 Smart Farmers won the short circuit Award of the City of Ghent. In 2016 Urban Smart Farm was awarded in the Innovation campaign of the Innovation Support for agriculture.